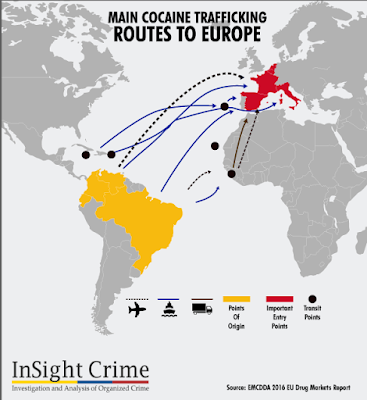 Cocaine seizures in Spain, Portugal and Ecuador illustrate the European cocaine pipeline that has become a central part of the operations of Colombian drug traffickers. 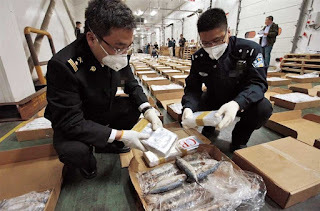 The group imported cocaine in shipping containers traveling from Panama to Portugal, and were in the process of importing 355 kilograms of cocaine stashed in pineapples. In Ecuador there was a seizure of 1.45 metric tons of cocaine hidden in a shipping container of frozen fish that was set to sail to Belgium. Today’s Colombian drug trafficking networks have been reduced to the role of wholesalers to Mexican cartels, who claim the biggest profits by controlling the movement of drugs into the US. In recent years, Colombian networks have been gradually making up for this shortfall in profits by seeking out other markets — Europe in particular. Cocaine produced in the north is often first trafficked by land or sea into Panama, and then onto Europe in shipping containers. 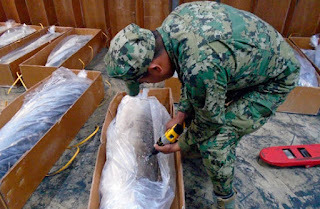 Cocaine produced in southern Colombia such as Putumayo, Nariño and Caquetá frequently crosses the border into Ecuador, where it is dispatched from ports, above all Guayaquil, where police seized 13.5 tons of cocaine last year. An increase in the size of shipments reaching Europe coincides with the dramatic increase in cocaine production in Colombia. In Europe, price differentials can be massive. A short hop from the Netherlands to the UK can increase profits by over 60 percent per kilogram. Attempts are being made by Colombian groups to move into intra-continental distribution. Colombian groups such as the Rastrojos and later the Urabeños have a level of armed presence in Europe, maintaining debt collection offices in Spain.